You are currently using a browser that we do not support. For a better experience please upgrade your browser. Find out how. 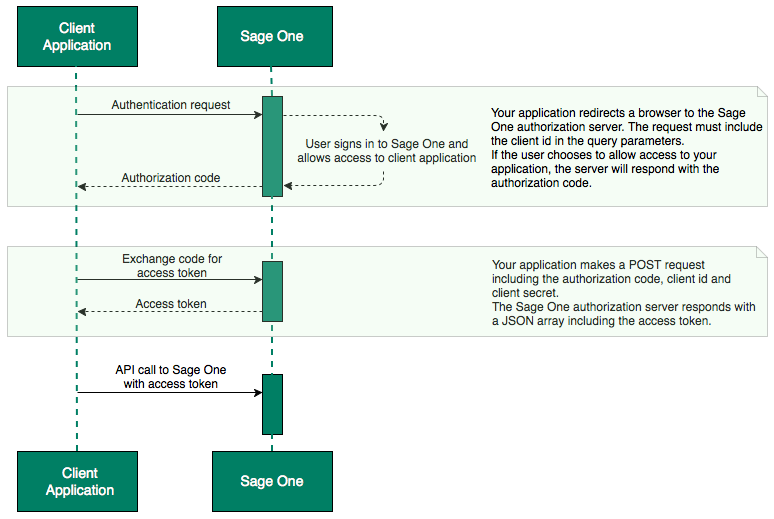 This section explains how to use OAuth 2.0 to allow Sage One users to authorize third party applications to access their data without sharing their actual login details. To see this in action, take a look at our API Authentication screencast. Note: You must store these securely and DO NOT share them with anyone. You must not check this information into source control. response_type - This is the type of response that you expect to receive. This is always code. client_id - The client id you received from Sage One when you registered. redirect_uri - The callback URL. This is where your users will be sent after authorizing. scope - Lets you specify the type of access to allow. Can be readonly or full_access. Read only does not allow you to modify any Sage One data. If you do not provide this parameter, the default is full access. state - A string used to protect against CSRF attacks. Although state is optional, we recommend including this. This should be a string that cannot be guessed. Note: If the value of the state parameter returned in the response does not match the state that was provided in the original request, it does not originate from the original request and you must not continue. When this endpoint is hit, the user is prompted to sign in to Sage One and asked if they want to authorize your application. Note: This can only be authorized by the business owner (the user that created the Sage One subcription). The authorization code expires after 60 seconds. access_denied This error occurs when the Sage One business user chooses not to authorise your application. invalid_request This error occurs when a required parameter is missing, invalid or provided more than once. invalid_scope This error occurs when the scope provided is invalid or unknown. You should ensure that scope in your request is either readonly or full_access. server_error This generic error occurs when the authorization server encounters something unexpected that prevents it from fulfilling the request. temporarily_unavailable This error occurs when the authorization server is unavailable. We recommend waiting for 10 minutes before retrying. unauthorized_client This error occurs when the client is not authorized to perform this action. This may be due to an incorrect client_id value. unsupported_response_type This error occurs when the authorization server does not support the method being used to request the code. You should ensure that the response_type in your request is code. You should now request an access token in exchange for the authorization code. client_secret - The client secret you received from Sage One when you registered. code - The authorization code provided in the response from the previous step. grant_type - The type of grant the code relates to. Either authorization_code or refresh_token. redirect_uri - The callback URL used to get the authorization code. Info: The access token expires after 1 hour. You can use the refresh token to obtain a new access token if it has expired. invalid_grant This error occurs when the grant_type provided is invalid or unknown. This error also occurs when the refresh token is expired or revoked. invalid_client This error occurs when the client cannot be authenticated. for example, if the client_id or client_secret are incorrect or invalid. unauthorized_client This error occurs when the client is not authorized to use the specified grant_type. unsupported_grant_type This error occurs when the authorization server does not support the grant_type specified. You should ensure that the grant_type in your request is authorization_code or refresh_token. During the authorization exchange, you are issued with an access token and a refresh token and you must include the access token in every API call. The access token expires after 1 hour. You can use the refresh token to obtain a new access token without the user having to sign in again to allow access. refresh_token - The refresh token provided in the response from the previous step. grant_type - This must be refresh_token. To ensure that a request has not been intercepted or tampered with in transit, every API call you make to Sage One must include an OAuth 1.0a HMAC-SHA1 signature. This also enables us to ensure that individual requests cannot be submitted more than once. We have provided the sageone_api_signer gem to handle the signing of your requests in Ruby. Warning: To ensure that your request is accepted, you MUST follow the steps precisely. Upon receipt of the request, the Sage One servers will perform the exact same actions to generate a signature. If the signatures don't match, your request will be rejected. To see this in action, take a look at our Signing your API requests screencast. Request Method This is the http request verb converted to upper case. For Sage One API requests this will always be GET, POST, PUT or DELETE. Base URL This is the URL to which the request is directed with the query parameters removed. Parameter String This is a percent encoded string representing the parameters from both the request body and the URL query string. Percent encode every parameter key and value to be signed. Sort the parameters alphabetically by encoded key. Set the output string to be an empty string. Append the encoded key to the output string. Append the = character to the output string. Append the encoded value to the output string. If there are more key/value pairs to add, append the & character to the output string and repeat steps 4 - 7.
nonce This is a unique token that your application should generate for each request. Sage One will use this value to prevent a request from being submitted more than once. The recommended way to generate a nonce is by base64 encoding 32 bytes of random data and stripping out all non-word characters. However, any approach which produces a relatively random alphanumeric string is acceptable. Convert the Request Method to uppercase and set the output string equal to this value. Append the `&` character to the output string. Percent encode the Base URL and append it to the output string. Percent encode the Parameter String and append it to the output string. Percent encode the nonce and append it to the output string. Your signature base string should contain exactly 3 '&' characters. Signing Secret This is provided when you register your client application. Access Token This is the access token acquired during the OAuth authorization process. Warning: These values are unique to your application, must be stored securely and must never be transmitted with your API requests. Percent encode the Signing Secret and set the output string equal to this value. Percent encode the Access Token and append it to the output string. To generate your signature, you must pass the values of your Signature base string and your Signing key to the HMAC-SHA1 hashing algorithm. Info: You can find out more about the algorithm here. Implementations of the algorithm are readily available for every popular programming language. The output of the HMAC signing function is a binary string. This must be base64 encoded to produce the signature string. You must include this signature and the nonce in your request header. To validate your request signature, you can direct your API call to the test endpoint. When hitting the test endpoint, you must replace your own signing secret with the string: "TestSigningSecret"
Valid requests will return 200 OK.
"error_description": "Please provide an 'Authorization' header with the following format: Bearer xxxxx." You can compare these values to the values returned by your application to help you identify and correct the problem. Note: The test endpoint does not validate if the token is correct. Creating a valid signature requires you to percent encode certain values. Note: Spaces must be encoded to %20 and not to + and encoded characters must always be upper case. For example, %2F rather than %2f. This section explains how to make an API call once you have the Access Token and request signature. Once you have the Access Token and OAuth Signature, you can make calls to the Sage One API for the specific user. -H "User-Agent: North Park Support Services"
Required and optional parameters are documented for each individual endpoint. This is a required parameter. You must provide this for POST and PUT requests. This is an optional parameter. When making a POST or a PUT request, you must supply the required parameters. You can also provide any optional parameters as required. Note: Your Content-Type header for POST and PUT requests must be Content-Type: application/x-www-form-urlencoded. Parameters are not required for GET or DELETE requests. Info: Some resources support optional search parameters for GET requests. These are documented for each individual resource. For successful GET, PUT and DELETE requests, you will receive an HTTP status code 200 and the body will contain the requested data in a JSON array. $totalResults - the number of results included. $startIndex - shows the first record in this range. $itemsPerPage - the number of records returned on each page. $resources - the actual records matching the query. These are simple applications that include authentication and the signing of requests. Responds with information about the business. The two-letter country code as defined by ISO 3166-1. Responds with address and contact information about the business. Responds with updated information about the business. This resource allows you to look up business relationships for the authenticated user. Implementation of this endpoint is on a per-country basis. Countries without an implementation will return an empty array. Responds with an array of business relationships. This resource allows you to read summary data about the authenticated user account. Is this account a demo account? Sage One Global Unique Identifier. Responds with summary business and user account information. Responds with information about the user. Responds with the user's name and email information. Responds with updated information about the user. This refers to the type of bank account. Examples include current account and savings account. This resource allows you to look up your Account Types in Sage One. The ID of the Account Type. The name of the Account Type. This is a universal semantic identifier for the item. As this value is always the same regardless of region, you should rely on this value rather than name. This is the SData key. Responds with all Account Types. Responds with the Account Type for the ID requested. This refers to the artefact statuses in Sage One. An artefact can be either invoice, credit note (both sales and purchase) or sales quote. This resource provides a look up of the artefact statuses in Sage One. The name of the Artefact Status. Responds with all Artefact Statuses. This resource allows you to look up your Bank Accounts in Sage One. The ID of the Bank Account. The name of the Bank Account. The Bank Account sort code. The contact telephone number for the Bank Account. The contact email address for the Bank Account. The Bank Account branch address. The ID of the Ledger Account. The current balance for the Bank Account. Responds with all Bank Accounts. Responds with the Bank Account for the ID requested. Creates a new Bank Account. Update the specified Bank Account. This resource provides a look up of the contact types in Sage One. The ID of the Contact Type. The name of the Contact Type. Responds with all Contact Types. Responds with the Contact Type for the ID requested. This resource allows you to read, add, update and delete Contacts in Sage One. The ID of the Contact. The company name of the Contact. The name of the Contact. Notes relevant to the Contact. First line of the main address, maximum 50 characters. Second line of the main address, maximum 50 characters. Town/City for the main address, maximum 50 characters. County for the main address, maximum 50 characters. Post code for the main address, in format 0000-000. The ID of the Country. The name of the Country. First line of the delivery address, maximum 50 characters. Second line of the delivery address, maximum 50 characters. Town/City for the delivery address, maximum 50 characters. County for the delivery address, maximum 50 characters. Post code for the delivery address, in format 0000-000. If required, you can filter the response by including the optional parameters shown below. Use this to get either customers(1) or suppliers(2). For example, use /accounts/v2/contacts?contact_type=1 to get only customers. Responds with the Contact for the ID requested. Creates a new Contact record. The name of the contact, maximum 50 characters. The name of the company, maximum 50 characters. The type of the contact. 1 = Customer, 2 = Supplier. The email address of the contact, maximum 100 characters. Email must be valid. The telephone number of the contact, maximum 50 characters. The mobile number of the contact, maximum 50 characters. Any notes for the contact record, maximum 500 characters. The tax/VAT number of the contact. Town for the main address, maximum 50 characters. Post code for the main address, must have the format 0000-000 for Portuguese addresses. Town for the delivery address, maximum 50 characters. The Tax Rate of the Contact. Updates an existing Contact record. Post code for the delivery address, must have the format 0000-000 for portuguese addresses. Deletes an existing Contact record. Countries are referenced in Sage One wherever an address is specified. For example, in a Contact record. This resource allows you to look up the Countries in Sage One. Responds with the Country for the ID requested. These are called types of expense in Sage One and are the categories a user can make purchases against. Users can create their own expense types to suit their business. This resource allows you to look up the Expense Types. The ID of the Expense Type. The name of the Expense Type. The nominal code for the Expense Type. The ID of the Tax Rate for this transaction. Responds with all Expense Types. This refers to 'Other Expense' transactions in Sage One. This resource allows you to read, add, update and delete Expense transactions from Sage One. Responds with all Expense transactions. If required, you can include the optional parameters below in your request URL to filter the response by date range. Date string represented as YYYY-MM-DD. See ISO 8601. Use this to limit the response to instances created, updated, or deleted since a given date (format: YYYY-MM-DDT(+|-)hh:mm ) or date-time (format: YYYY-MM-DDThh:mm:ss(+|-)hh:mm ). For example, /accounts/v2/expenses?updated_or_created_since=2014-06-25 or /accounts/v2/expenses?updated_or_created_since=2014-06-25T10:30:00-04:00. The timezone offset ( (+|-)hh:mm ) defaults to UTC if it is not provided. Note: Client data is stored in Eastern Time (US & Canada) on the servers so please set the Eastern Time offset to get the correct response. Responds with the Expense transaction for the ID requested. Creates a new Expense transaction. Update the specified Expense transaction. Delete the specified Expense transaction. This resource allows you to read and update financial settings. The last day of the business year. The chart of accounts (COA) that is used by the business. The tax submission frequency type ID. The tax submission frequency type name. The identifier of the tax submission frequency type. The identifier of the tax scheme. The VAT ID of the business (USt-ID) always will be null. Responds with the financial settings for the business. These are called types of sale in Sage One and are the categories a user can make sales against. Users can create their own sales types to suit their business. This resource allows you to look up these sales types. The ID of the Income Type. The name of the Income Type. The nominal code for the Income Type. Responds with all Income Types. This refers to 'Other Income' transactions in Sage One. This resource allows you to read, add, update and delete income transactions from Sage One. The ID of the Income transaction. The date of the Income. The date of the invoice associated with the Income. The net amount of the Income. The tax amount of the Income. The gross amount of the Income. The tax rate percentage for the Income. The ID of the tax period for the Income. The reference of the Income. The customer associated with the Income. The bank account receiving the Income. The ID of the Income Method. The void status of the Income. Responds with the Income for the ID requested. Creates a new Income transaction. The date of the Income in the format dd/mm/yyyy. The date of the invoice associated with the Income if applicable. In the format dd/mm/yyyy. Set to 1 if the amount includes tax. Updates an existing Income transaction. Deletes an existing Income transaction. This resource allows you to read and update invoice settings. Days between Sales Invoice date and due date. Days between Purchase Invoice date and due date. Days between Sales Quote date and due date. Default Email text for Sales Invoices. Default Email for Sales Quotes. Default Email for Sales Credit Notes. "default_email_message_for_sales_credit_note": "Email for Sales Credit Notes"
Responds with the invoice settings for the business. -d "invoice_settings[default_email_message_for_sales_credit_note]=Another Email for Sales Credit Notes"
"default_email_message_for_sales_credit_note": "Another Email for Sales Credit Notes"
This refers to the ledger account Types in Sage One. This resource provides a look up of the ledger account types in Sage One. The ID of the Ledger Account Type. The name of the Ledger Account Type. Responds with all ledger account types. This resource provides a look up of the ledger accounts in Sage One. The nominal code of the Ledger Account. Responds with all Ledger Accounts. Responds with the Ledger Account for the ID requested. This refers to the payment methods in Sage One. This resource provides a look up of the payment methods in Sage One. The ID of the Payment Method. Responds with all Payment Methods. This is called rate frequency in Sage One and refers to the chargeable period of a service. For example, you may charge by the hour or by the day. This resource provides a look up of the period types in Sage One. The ID of the Period Type. The name of the Period Type. Responds with all Period Types. Responds with the Period Type for the ID requested. This resource allows you to read, add, update and delete products in Sage One. The ID of the product. Product code (maximum of 255 characters). The URL for the API call for this resource. If required, you can include the optional parameters below in your request URL to filter the response by product description. Responds with the Product for the ID requested. The product code, maximum 30 characters. The product description; has a maximum of 255 characters. Any notes associated with the product (maximum of 500 characters). The product description, maximum 100 characters. Product code, maximum of 30 characters. -d "product[notes]=a variant of product 1"
This resource allows you to read, add, update and delete purchase credit notes in Sage One. The ID of the Purchase Credit Note. Responds with all Purchase Credit Notes. Responds with the Purchase Credit Note for the ID requested. Creates a new Purchase Credit Note. This should be the supplier (contact_type 2) associated with the credit note. The name of the contact associated with the credit note. This should be the contact[name_and_company_name] from the specified contact. The credit note date in the format dd/mm/yyyy. The line items on the credit note. The description of the line item, maximum 60 characters. The number of units on the line item. The unit cost of the line item. The tax amount of the line item. The tax rate percentage for the line item. Any additional information, maximum 1000 characters. Delete the specified Purchase Credit Note. This resource allows you to read, add, update and delete purchase invoices and payments in Sage One. The ID of the Purchase Invoice. The payment status of the Purchase Invoice. The ID of the Payment Status. The payment due date of the invoice, in the format dd/mm/yyyy. The invoice date in the format dd/mm/yyyy. The void reason of the Purchase Invoice. The amount outstanding for the Purchase Invoice. The net amount of the Purchase Invoice. The tax amount of the Purchase Invoice. The ID of the tax period for the Purchase Invoice. The ID of the contact to be associated with the purchase invoice. This must be a supplier (contact_type 2). The name of the contact associated with the invoice. This should be the contact[name_and_company_name] from the ID of the specified contact. The main address of the contact to be associated with the Purchase Invoice. The delivery address of the contact to be associated with the Purchase Invoice. True if the delivery address is the same as the main address. Terms and conditions associated with the Purchase Invoice. The ID of the line item to update/delete. When updating, if this is not specified a new line item is created. The net amount of the line item. True if the line item price includes tax. The product code for the line item. The ID of the Service. Responds with all purchase invoices, including the ones that are voided already. If required, you can include the optional parameters below in your request URL to filter the response by date range, contact ID or payment status ID. Responds with the Purchase Invoice for the ID requested. Creates a new Purchase Invoice. This should be the supplier (contact_type 2) associated with the invoice. The name of the contact associated with the invoice. This should be the contact[name_and_company_name] from the specified contact. The line items on the invoice. Updates an existing Purchase Invoice. The ID of the item line that you want to update. If this is not provided here, a new line will be created. Set to 1 if you want to delete the line item. Delete the specified purchase invoice. If required, the optional parameter void_reason can be included to specify the reason for deletion. The reason the invoice is being voided. If not supplied, this defaults to ‘no void reason supplied’. Responds with all Payments associated with the specified Purchase Invoice. Responds with the Purchase Invoice Payment for the ID requested. Creates a Payment associated with the specified Purchase Invoice. The amount of the payment. The payment date in the format dd/mm/yyyy. Deletes an existing Purchase Invoice Payment. This resource allows you to read, add and delete sales credit notes in Sage One. The ID of the Sales Credit Note. The ID of the contact to be associated with the sales credit note. This must be a customer (contact_type 1). The name of the contact associated with the credit note. This should be the contact[name_and_company_name] from the ID of the specified contact. The ID of the associated invoice. The payment status of the Sales Credit Note. The Sales Credit Note reference. The void reason of the Sales Credit Note. The net amount of the Sales Credit Note. The tax amount of the Sales Credit Note. Would be taken from associated invoice. The unit price of the line item. Responds with all sales credit notes, including voided ones. Responds with the Sales Credit Note for the ID requested. Creates a new Sales Credit Note. The Sales Credit Note date in the format dd/mm/yyyy. The carriage amount for the credit note. The tax rate id for the carriage. Void the specified sales credit note. This resource allows you to read, add, update and delete sales invoices in Sage One. The ID of the Sales Invoice. The ID of the contact to be associated with the sales invoice. This must be a customer (contact_type 1). The payment status of the Sales Invoice. The void reason of the Sales Invoice. The outstanding amount for the Sales Invoice. The net amount of the Sales Invoice. The tax amount of the Sales Invoice. The main address of the contact to be associated with the Sales Invoice. The delivery address of the contact to be associated with the Sales Invoice. Terms and conditions associated with the Sales Invoice. The unit selling price of the line item. The payments made for the Sales Invoice. The ID of the Sales Invoice Payment. Payment amount. Payment amount must be greater than 0 and less than or equal to the outstanding amount. Payment reference(maximum of 255 characters). The bank account to which the payment is made. Name of the Bank Account (maximum of 255 characters). The date when the payment is made, in the format yyyy-mm-dd. The mark to indicate that it is a cheque. The carriage amount for the invoice. The tax rate percentage for the carriage. Indicates if the items unit prices include tax. Responds with all sales invoices, including voided ones. Responds with the Sales Invoice for the ID requested. Creates a new Sales Invoice. The name of the customer associated with the invoice. This should be the contact[company_name] from the ID of the specified customer. The reference of the invoice. The main address line one of the customer. The main address line two of the customer. The main address postcode of the customer. The main address city of the customer. The main address country of the customer. The delivery address line one of the customer. The delivery address line two of the customer. The delivery address postcode of the customer. The delivery address city of the customer. The delivery address country of the customer. Set to true or 1 if the main address is the same as the delivery address. Id of the withholding tax rate. If the line item relates to a product or a service, you should provide the id here. This does not automatically provide the quantity and unit price. You must provide these as separate parameters. The discount percentage for the line item. Void the specified sales invoice. This refers to the sales quotes in Sage One. This resource allows you to read, add, update and delete sales quotes in Sage One. Responds with all Sales Quotes. Responds with the Sales Quote for the ID requested. This resource allows you to read, add, update and delete services in Sage One. If required, you can include the optional parameters below in your request URL to filter the response by service description. Responds with the Service for the ID requested. The service code. Must be unique among products and services. The service description (maximum of 100 characters). The service unit sales price. Any notes for the service (maximum of 500 characters). -d "service[notes]=a variant of service 3"
This refers to the different tax rates in Sage One. For example, standard and zero rated. This resource provides a look up of the tax rates in Sage One. The ID of the Tax Rate. The name of the Tax Rate. The percentage rate of the Tax Rate. True if the Tax Rate is currently active. Responds with all Tax Rates. Responds with the Tax Rate for the ID requested. This refers to the different withholding taxes in Sage One. For example, standard and zero rated. This resource provides a look up of the withholding rates in Sage One. The ID of the Withholding Tax. The name of the Withholding Tax. The percentage rate of the Withholding Tax. Responds with all Withholding Tax Rates. Responds with the Withholding Tax Rate for the ID requested.